RateSetter is a British peer-to-peer lending platform that provides loans to households and businesses. Since launching in Autumn 2010 they’ve lent around £2bn, making them one of the ‘big 3’ platforms (RateSetter, Zopa, Funding Circle). RateSetter are a ‘hands-off’ platform with no individual loan-part management/selection: you just choose an investment product and rate. For this reason it’s an easier platform to start off with for P2P lending beginners. You choose an investment product and rate of return that you would be happy to lend at, then wait for the lending market to match your offer. Choose a rate that is too high and your money will be sat there without earning interest. Choose a rate that is too low and miss out on higher returns! RateSetter’s Business Model – how does it work? What does the Provision Fund Cover? Can I withdraw my money early? Sell Out: Yes, fees depend on investment product. Speed of Investment: Very fast, depending on the rate you select. Ratesetter are one of the most well known UK P2P lending platforms. Like Funding Circle the UK Government uses it as a vehicle to invest in companies via the ‘British Business Bank’. According to a freedom of information request from Business Insider, as of December 2016 the the Government bank had lent £10 million to small businesses via Ratesetter. 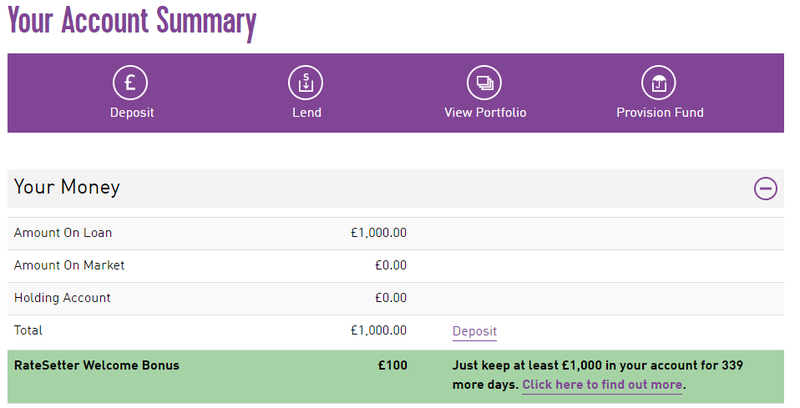 Ratesetter have a provision fund, which means that to date no-one has lost money though investing via the platform. Ratesetter’s trading history, size and proxy-recognition from the government gives it a perceived platform risk lower than its smaller and newer competitors. RateSetter take an admin fee and ‘Credit Rate Fee’ from accepted borrowers. The Credit Rate Fee goes towards the provision fund. Investors (lenders) deposit money and choose an investment product. Investors then either chose to lend at the market rate or select their own rate (practical details below). 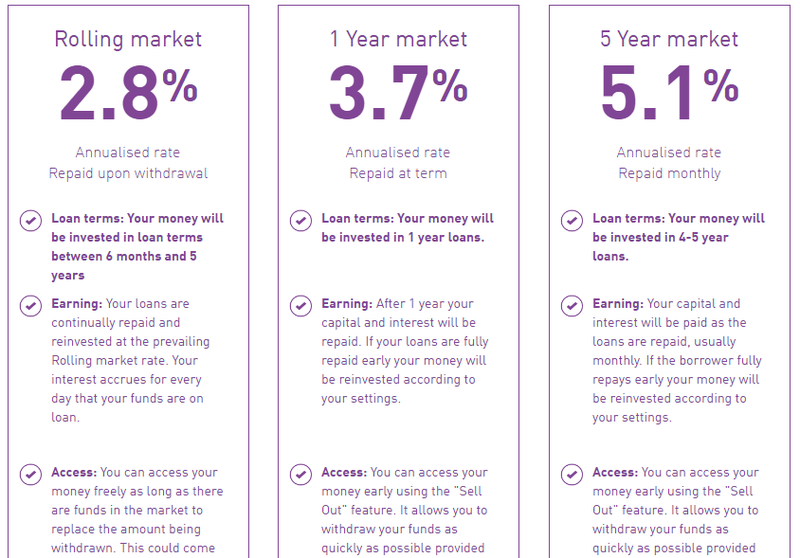 RateSetter match your investment with borrowers – the lowest investor rates are first in line. If the provision fund runs out, RateSetter can make an “Interest Reduction” or a “Capital Reduction”. This was a November 2016 update to the terms. 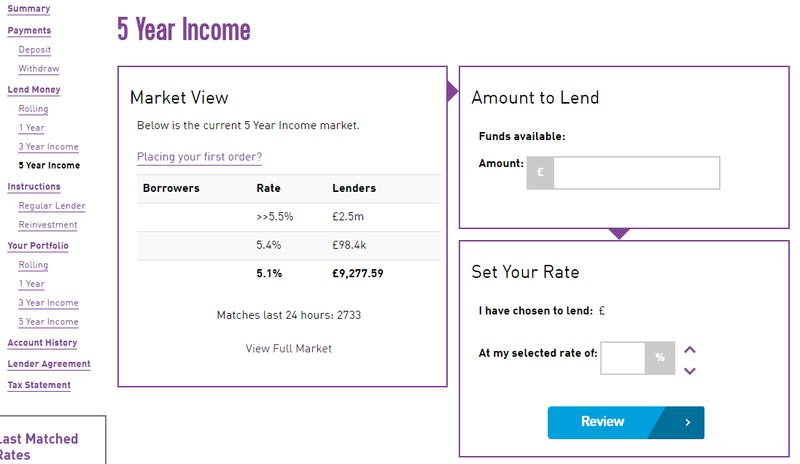 RateSetter make their money on the admin fees for borrowers. There was a 10% investor fee, but this was removed from RateSetter in May 2014. Since February 2017 the UK’s Financial Conduct Authority (FCA) has been cracking down on P2P lending to other lending companies and RateSetter says it has now discontinued this type of lending. As you can see from the charts above, they’ve been increasing loans to property developers and businesses to compensate. How healthy is the RateSetter Business itself? 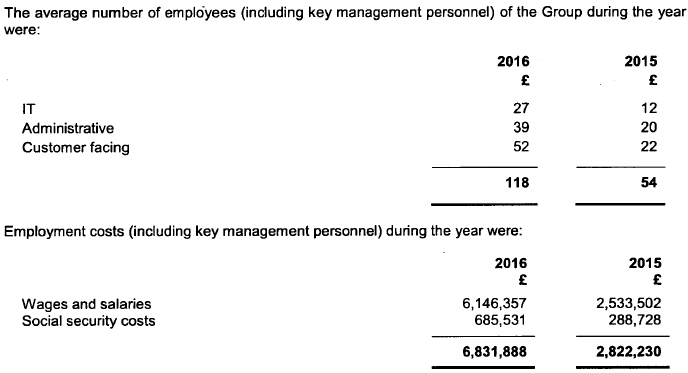 Over the last 3 years they’ve raised £43 million in investment rounds, the most recent for £13 million in May 2017 from Neil Woodford’s investment fund (source: crunchbase). According to CityAM this latest fund raise valued the company at more than £200 million. I welcome your thoughts on these numbers in the comment section below as I am sure some readers will have far more experience looking at company accounts than I do! Personally, I think it looks healthy and I’m not particularly worried about the company burning through their investment capital. Investment Process: How to Invest in Ratesetter … and get the best rates! Above, there’s only £9,277 waiting to be lent out at 5.1%, and another £98.4k waiting to be lent out at 5.4%. If you set your rate now at 5.4% you’ll probably have it lent out within hours, and with a bit of luck setting it at 5.5% you will match in a day or two. So just by clicking on the ‘Ratesetter expert’ link and setting it at 5.4% you’d earn an extra £18 on a £1000 investment for 5 years. You can choose which product you wish to reinvest your interest at. Although you’ll earn slightly less, it’s probably not worth the hassle of manually setting the best rate after every payment. For example taking the scenario above, if you have £2000 invested at 6%, your £10 dividend payment would just earn you 18p more over 5 years if you log in and set it yourself. Source: P2Pblog/P2x records of RateSetter public data. Click the image above to go to an interactive report. Shortly after I published the report above, they updated their statistics page to break the provision fund down by ‘Interest Coverage Ratio’ and ‘Capital Coverage Ratio’. Unfortunately this broke my records tool without me realising and I have very little data since then. It’s now recovered somewhat, to around 1.23 as I write, just below the 125% target. 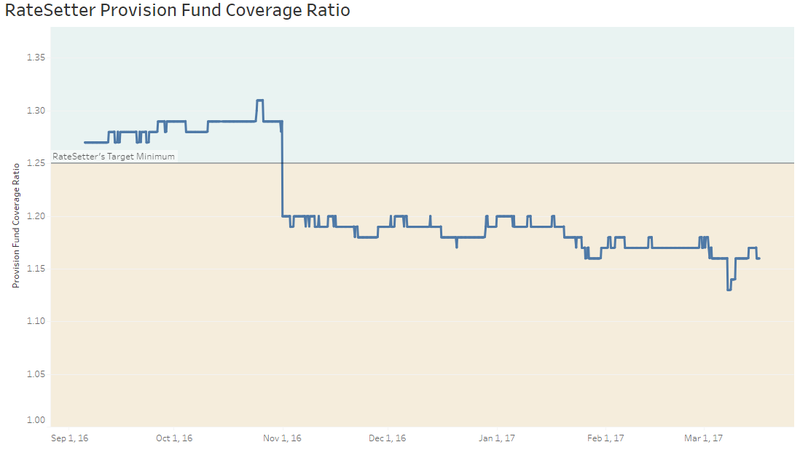 The interest coverage ratio shows how well the provision fund covers expected future losses. This has improved from around 1.17 in March 2017 to 1.23 in July 2017. The new ‘Capital Coverage Ratio’ shows how well the provision fund + investors future interest covers expected losses, and currently stands at 300%. This means that future losses would have to more than 3 times RateSetter’s estimate of future losses before investors’ initial capital starts to be at risk. I don’t want to scare you off with the chart above. I think it’s great that a company is so open about their provision fund data even when it’s not meeting their target. Some of RateSetters competitors are not so open about their provision fund, or have sneakily removed the public data when things started to look bad. You have access to sell out your investments early. The rolling product is free and easy to sell out of. To sell out, click “Withdraw” on your dashboard, then “Sell Out -> Next” [bottom right], then select the amount to withdraw. You have to wait a while, usually around an hour, and then are free to withdraw the money. I’ve done this several times and had no problem. All the other products you can access early, through the “sell-out” function. But there is a cost as the loans have to be refinanced as we want to avoid “gamers” taking the higher interest rates knowing they plan to withdraw early. The fee varies depending on the rates you previously attained compared to today’s going rates, as your loans have to be filled. Therefore the actual cost can vary, but if you search “sell-out” on this forum I’d argue the average seems to be around 0.6%, but can vary from near £zero to 3% in some circumstances. So, if I sold out of the 5 year product early I’d have around 3.4% fees to pay. For me, if rates across the board have fallen or stayed the same and someone is prepared to buy my loan-book, why should I have to pay a large penalty? On the other hand, RateSetter maintain this is to prevent people from gaming the system and treating it as a high-paying easy access account. In effect, this penalty probably keeps the rates of return higher by reducing demand by those with shorter timescales. Ratesetter is a well established and simple platform that still retains some of the excitement in peer-to-peer lending by giving manual control over rates. If you are a new investor, please take the time to understand ‘set your own rate’ versus ‘market rate’ before making your first investment. I’ve spoken to several readers of this blog who got locked into a 5 year term at a lower rate than they could have had. To make it clear – I’ve written a specific post on this tip for new users (link). ‘Hands-off’ – RateSetter do all the borrower checks and due diligence, you just select your rate. Provision Fund that has performed well historically, with open data on current coverage and expected future performance. Open to new investors – unlike Zopa! Growth Street – 30 day roll over loans with 6%+ returns, though recently investors have been reporting longer waiting times for reinvestments. Assetz Capital – 7% returns with provision fund in the GBBA account or 3.75% in the quick access account. Funding Circle – another large and well established P2P lending platform, which states expected returns around 6.9%. It’s harder to understand than RateSetter and does not come with a provision fund – relying on diversification instead. Lending Works – 4.8% returns on the 5 year investment with provision fund, insurance and the Innovative Finance ISA. *Links marked with a star are referral links to RateSetter. If you join and register via these links you are eligible for a £50 bonus if you invest £1,000 for 365 days, and I will also receive a £50 bonus. This goes towards building this site and the independent p2x.co.uk comparison tool. Yes it does tend to take longer in the Assetz GBBA account, but if you also have a QAA account any uninvested money can be automatically swept in to that until invested and earn 3.75% while it is waiting.